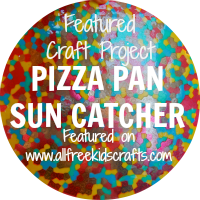 While we were recently working with cement, we had a brainstorming idea! 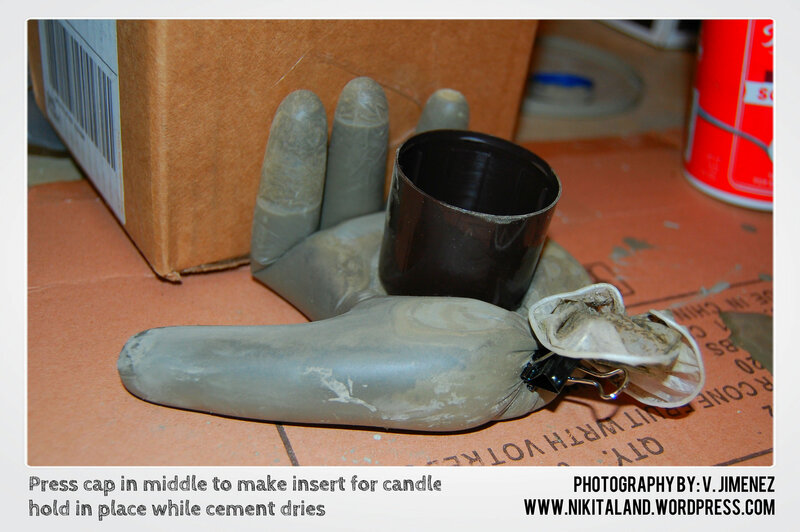 Since we love Halloween a lot, we decided to try making a Cement Hand to hold our tealights, and the results were awesome! In our last post, DIY Cement Tealight Holders, we showed you how to mix up your Quikrete Anchoring Cement, so you should be up to date on that part of the process. So, now that you have mixed your cement, take your latex glove and carefully pour the cement in the fingers first so that they fill up, then fill the rest of the glove, but make sure you keep enough room at the top of the glove so you can twist the end together and clamp it off with a binder clip. 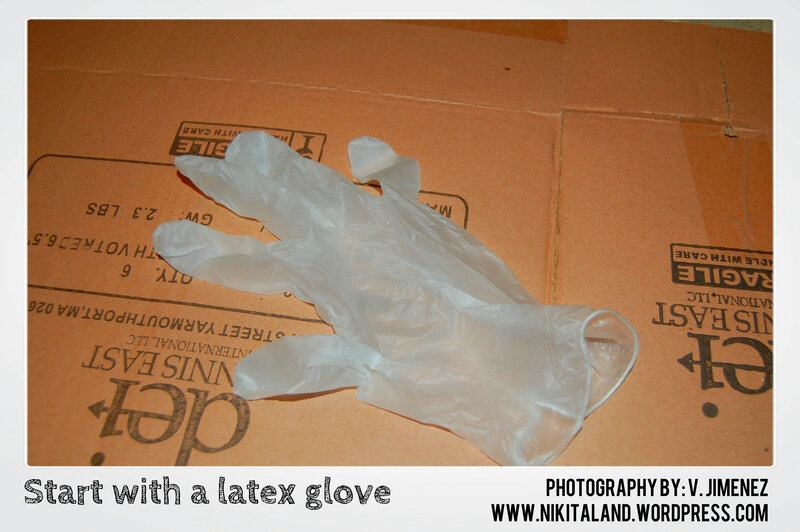 Next, lay the glove on a flat surface to dry. 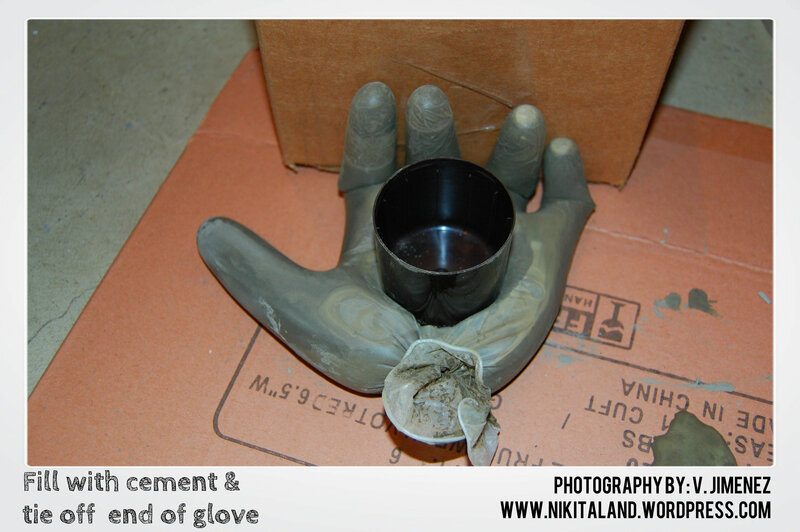 To get your fingers to stand up in the air, slide the glove filled with cement up against a box to hold up the fingers. Then, take one of your laundry detergent caps that we used in making our other cement tealight holders, and hold it in place in the middle of the palm of your hand. Keep holding the cap in place until you feel the cement start to harden. (pushing down on the cap also helps get rid of any air bubbles you might get under the glove) Keep pressing down on the cap until the entire hand has hardened, which is about 5-10 minutes. 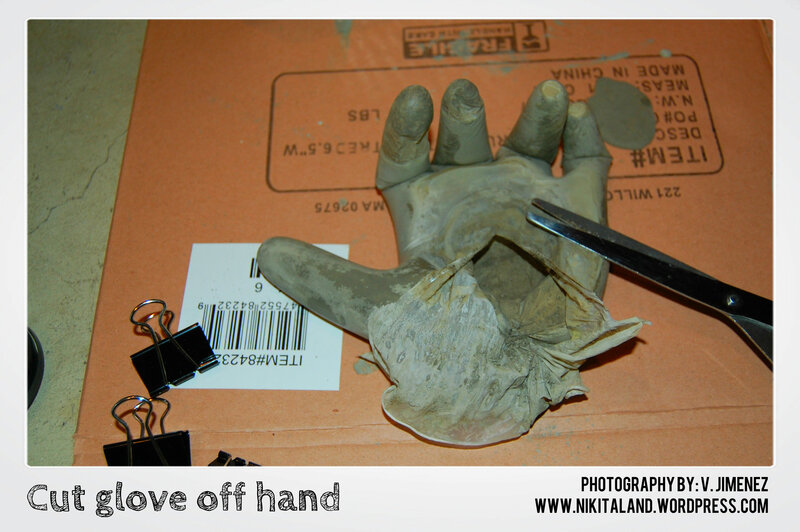 Once the hand is formed well, let it sit for about another 10 minutes to cure properly. 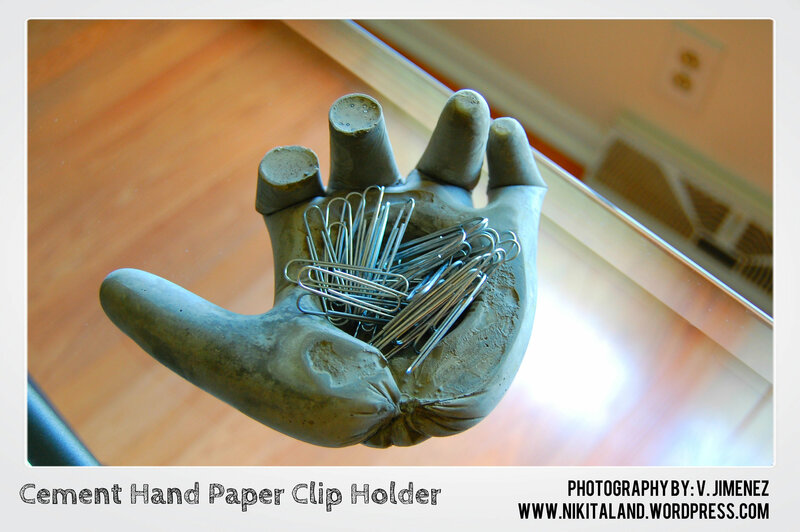 Take off the binder clip and carefully cut the glove with scissors off the cement hand. 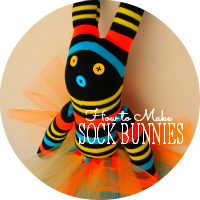 Work carefully around each finger, as part of the glove will be caught under the grooves of the bent fingers and you might need tweezers to remove all the glove in this area. 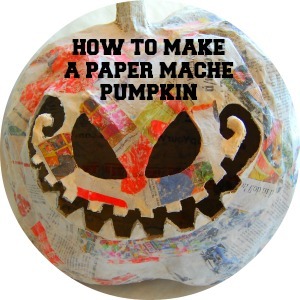 NOTE: While making our first cement hand, we noticed that when we bent the fingers up against a box, the cement did not completely fill each finger to the tip, but that’s ok because it looks like a finger or two was cut off, just perfect for a Halloween effect! 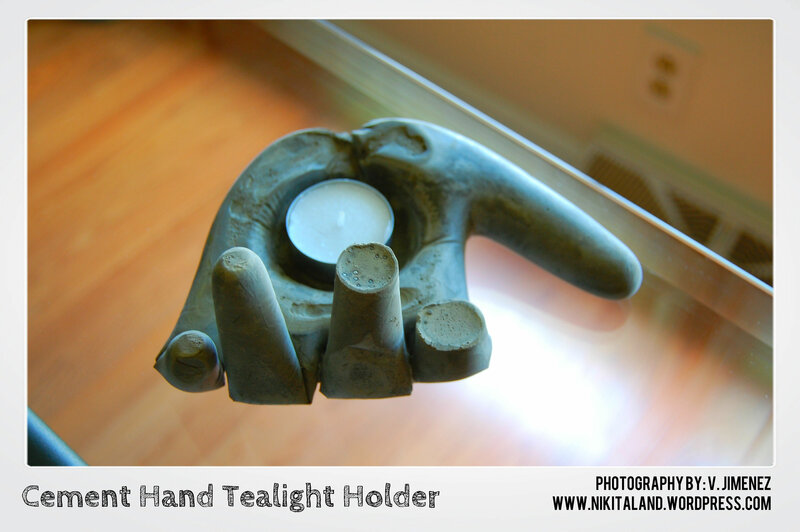 You now have a finished cement hand to hold your tealight candle, or perhaps you can fill the indent in the palm with paperclips! If you use a cap large enough, the indent you make could possibly hold a drinking glass and use the cement hand as a coaster! The possibilities are endless, but be creative, have fun, and make sure you wear your own pair of gloves when working with any kind of cement! 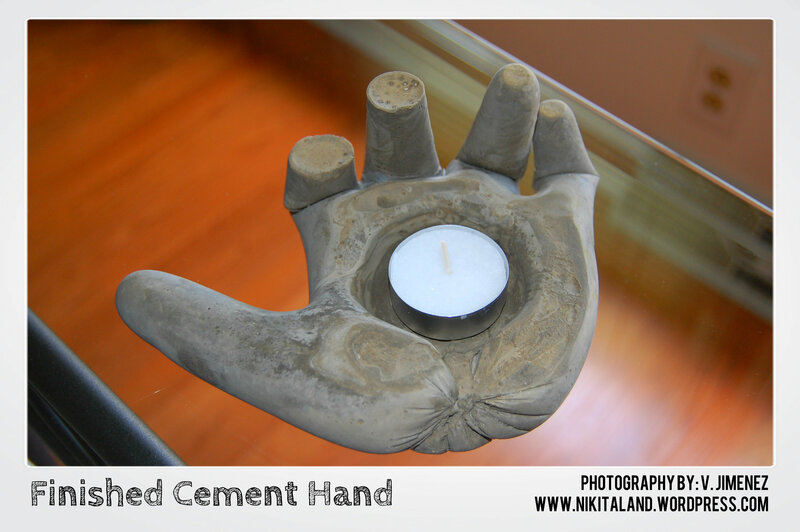 If you make any Cement Hands yourself, please share with us what you have made!